Any accumulation of snow and ice should be removed from the windshield before driving. Otherwise, your vision may be impaired, which could endanger you or others. ► To switch on: press button 2. Indicator lamp 1 lights up. ► To switch off: press button 2. 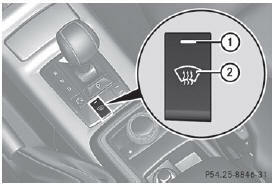 At outside temperatures above 50 º F(10 º C), the windshield heating cannot be activated. Indicator lamp : lights up briefly when you attempt to activate it and then goes out again. The windshield defroster has a high current draw. You should therefore switch it off as soon as the windshield is clear. The windshield heating otherwise switches itself off automatically after 10 minutes. If you turn on the windshield heating for the fourth consecutive time, the windshield heating will automatically switch off after 5 minutes. If the vehicle's electrical system voltage is too low because too many electrical consumers are switched on, indicator lamp 1 flashes. After approximately 30 seconds, the windshield heating turns off automatically.